In a world filled with wonder and knowledge at our fingertips, it’s arguably one of the greatest inventions ever known to man. It’s a vast wonderland of fun, shopping, personality and image enhancement, and even money making that we can’t seem to get enough of. It’s a world that never sleeps, and I mean never, almost to the point that it’s too much to keep up with. Some inhabitants of this world will bring you up, and others will rip you to shreds. Welcome to the Internet. This is the setting for our friends in Ralph Breaks the Internet, the sequel to the 2012 Disney animated film Wreck-It Ralph. Ralph Breaks the Internet finds Ralph (John C. Reilly) and Vanellope von Schweetz (Sarah Silverman) spending their days at their jobs racing in Sugar Rush and crushing buildings in Fix-It-Felix, while having fun in the evenings around the arcade. Life is perfect…until the steering wheel for Sugar Rush breaks during game-play, putting Vanellope’s home in jeopardy. However, after the arcade owner installs a new WiFi router, Ralph hatches a plan to go to eBay and retrieve a new wheel to fix the game. In so doing, their seemingly easy task may not be such a simple feat in the unknown world of the Internet. Masterfully animated with just about every detail you could think a virtual world would contain (but would you expect nothing less of Disney? 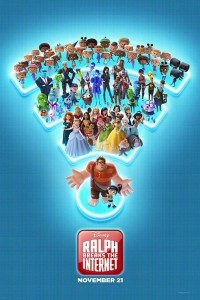 ), Ralph Breaks the Internet is the ultimate mix of family-friendly entertainment and witty satire. Real life users of the Internet are represented by avatars (sort of reminiscent of Wii avatars) as they travel around from Website to Website. The websites are represented as buildings, with the largest of them being shown as skyscrapers (Google, Amazon, IMDB, etc…). Unfortunately, we do not make a cameo in this film. Obnoxious pop-up ads harass avatars as they browse the web with schemes to make money playing video games, instant money winnings, redirectings to different sites, and all of the delightful ads we’ve come to love and cherish. Of course no movie about the Internet would be complete without cameos from your favorite social media personalities, such as Miranda Sings and Danny Fernandez! Just like all of us in the real world, even Ralph and Vanellope become privy to social media. After a video of Ralph goes viral with the help of Slaughter Race boss Shank (Gal Gadot), Ralph and Vanellope are referred to Yesss (Taraji P. Henson), the head algorithm for BuzzTube. Ralph instantly becomes a viral sensation with his videos mimicking popular YouTube video genres, ranging from screaming goats, baking tutorials, makeup tutorials, and even bee puns. Like many of us, Ralph instantly becomes addicted and will do just about anything for those “likes”. But he also learns that Internet fame isn’t such a perfect world when he falls victim to Internet trolls, ending his viral Internet run. Don’t worry, I haven’t forgotten about that scene. Yes, you know, the one with the princesses. When Vanellope gets sent to a Disney website, she is welcomed to a mecca of all things Disney. She runs into everyone from Grumpy, Eeyore, Tinkerbell, even Stan Lee! Then, after a run in with some Stormtroopers that recognize she isn’t supposed to be there, Vanellope frantically searches for a place to hide, ending up in the dressing room of the Disney princesses. The scene openly knocks the stereotypes that princesses have created amongst society (maidens needing to be saved by a big strong man) all the while making it the most humorous moment of the film. I’d be lying if I didn’t say I have been looking forward to that scene in its entirety for months now, and it was definitely worth it. With every Disney movie comes a valuable lesson. This movie’s lesson? Although the Internet can be a wonderful and exciting place, it can also be very dark and dangerous if we’re not careful. Ralph Breaks the Internet is cute, witty, and downright hilarious. While it’ll be a sell out for the kids, it’ll be just as big of a hit for the adults! By Dylan Tracy On November 16, 2001, J. K.